The neutral "go with anything" color of these peridot heart-shaped earrings make them a colorfully versatile selection. The beautiful colored gem is cut into a heart shape to add a sense of elegance to the already wonderful piece of jewelry. These earrings are all natural, with no mockery substances. The stone is completely genuine which will ensure that they will definitely stand out in the best way possible. With the jewelry being completely genuine and natural, you will be sure you are not entering any harmful substances into your body. The 4mm stone is fixed with 14K White Gold that accompanies the fixture and colors that shine perfectly.
" 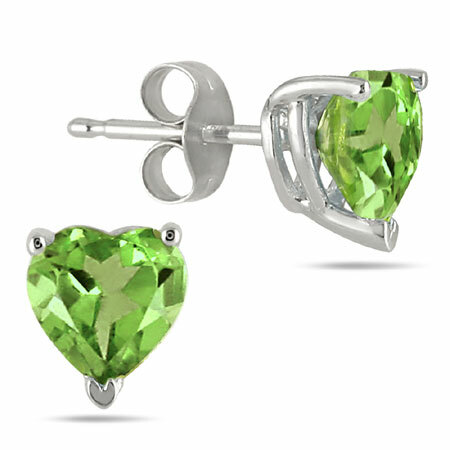 color of these peridot heart-shaped earrings make them a colorfully versatile selection. The beautiful colored gem is cut into a heart shape to add a sense of elegance to the already wonderful piece of jewelry. These earrings are all natural, with no mockery substances. The stone is completely genuine which will ensure that they will definitely stand out in the best way possible. With the jewelry being completely genuine and natural, you will be sure you are not entering any harmful substances into your body. The 4mm stone is fixed with 14K White Gold that accompanies the fixture and colors that shine perfectly. We guarantee our Heart-Shape Peridot Studs, 14K White Gold (4mm) to be high quality, authentic jewelry, as described above.